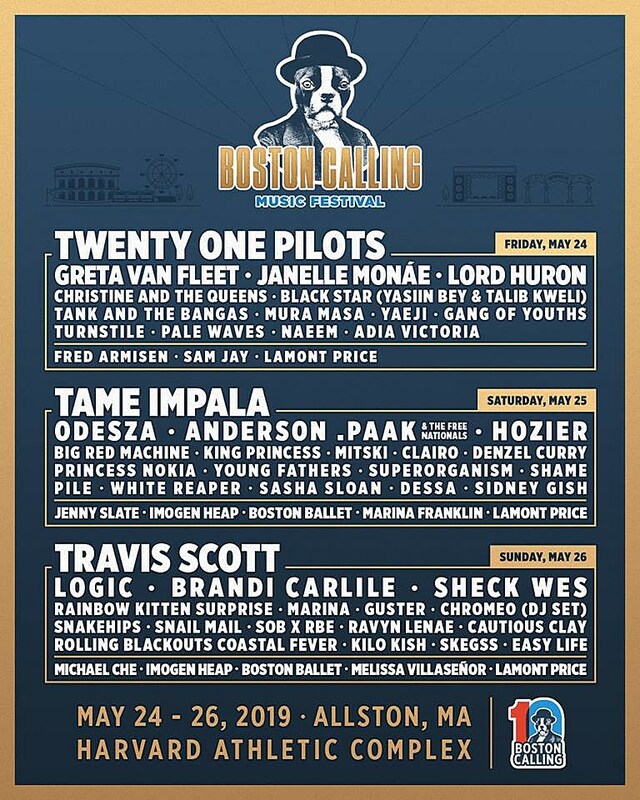 The day-by-day lineups have been announced for Boston Calling 2019, which goes down Memorial Day Weekend (May 24-26) at the Harvard Athletic Complex. Friday has some of the festival’s best acts early on, including Janelle Monae, Black Star (Yasiin Bey & Talib Kweli), Christine and the Queens, Lord Huron, Gang of Youths, Turnstile, Yaeji, and comedy from Fred Armisen, but the big names that day are Twenty One Pilots and Greta Van Fleet, so… good day to go home early! Saturday is headlined by Tame Impala and also includes ODESZA, Anderson .Paak, Big Red Machine (Justin Vernon & Aaron Dessner), King Princess, Mitski, Clairo, Denzel Curry, Princess Nokia, Young Fathers, Superoganism, Shame, Pile, White Reaper, Dessa, Sidney Gish, comedy from Jenny Slate, and more. Sunday is headlined by Travis Scott and also features Logic, Brandi Carlile, Sheck Wes, Guster, Snail Mail, SOB x RBE, Ravyn Lenae, Rolling Blackouts Coastal Fever, comedy from SNL’s Michael Che and Melissa Villaseñor, and more. Imogen Heap is doing a spoken word set in the comedy arena on both Saturday and Sunday. Single-day tickets go on sale Thursday (1/24) at 10 AM. Three-day passes are still available.